- If August 1st falls on a Monday through Friday, the cycle begins with the Small Paraklesis. If August 1st falls on a Saturday or Sunday, the cycle begins with the Great Paraklesis. - On the eves of Sundays (i.e., Saturday nights) and on the eve of the Transfiguration (the night of August 5) the Paraklesis is omitted. - On Sunday nights, the Great Paraklesis is always used unless it is the eve of Transfiguration. In the Russian Orthodox Church, the equivalent of a Paraklesis is the Moleben, which is similar in structure, except that the canon is omitted, retaining only the refrains and Irmoi of the third, sixth and ninth odes. When the full service itself is performed, it is called the "Supplicatory Canon" (Molebnyj Kanon). The reason these services are called "Paraklesis" (Supplication) is because the faithful gather to supplicate the Theotokos to intercede on their behalf to her Son and our God for our salvation and for the relief of anything that burdens and ails us. They are the prayers of suffering and hurting children addressed to their compassionate Mother, who is their only hope, protectress, and surety in time of need. 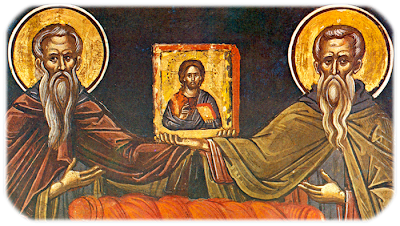 According to liturgical Professor John Fountoulis, even though the two Canons to the Theotokos are differentiated with the title "Small" and "Great", in fact they have the same number of Troparia, both having thirty-two with four in each Ode. However the Great Canon is more extensive, though this does not justify the epithet. The real reason seems to be that the Great Canon is chanted in a more festive tone during the Dormition Fast than the Small Canon, as shown in the Dismissal Hymns which begin: "O you Apostles from afar, being now gathered together here in the village of Gethsemane, lay my body in burial; and You, my Son and my God, receive my spirit." Little research has been done on the historical circumstances that led to the poetry of the two Canons and the final morphology of the two Supplications. Regarding the Great Supplication Service, we have sufficient testimony to its authorship. The poet was Theodore II Doukas Laskaris, Emperor of Nicaea. He was an emperor in exile who reigned from 1254 to 1258 AD following the fall of Constantinople to the Frankish Crusaders in 1204. 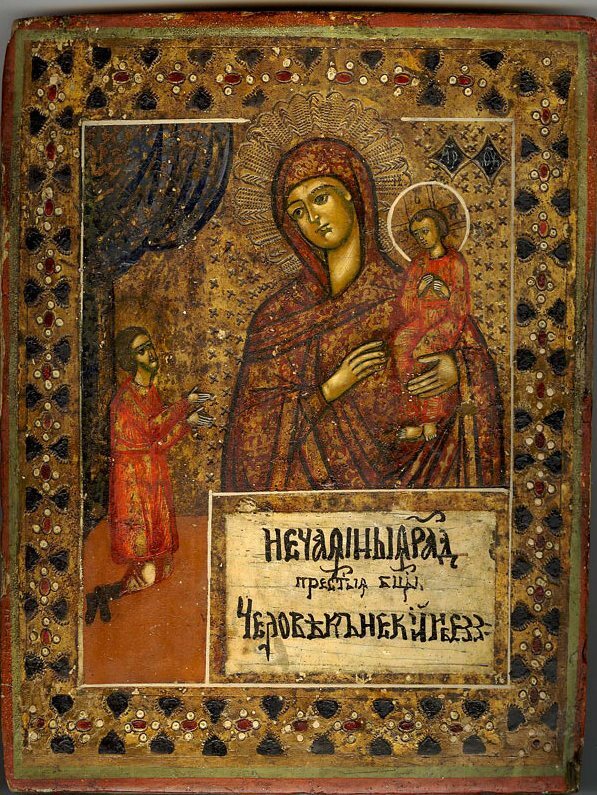 Regarding this history, see The History of the Great Paraklesis (Supplication) Canon to the Theotokos. The Small Supplication Service is older than the Great Supplication Service and its authorship is attributed by some to Theosteriktos the Monk, who lived in the 8th century. Others speculate it to be the work of Metropolitan Theophanes the Confessor of Nicaea who lived in the same century. Some even put forward St. John the Damascene as the composer. Recent research on the authorship of the Small Paraklesis states that it was authored by Saint Theosteriktos the Confessor. He used the previously authored Canon to the Theotokos by St. Theophanes the Branded and other liturgical and ecclesiastical sources to compose the Small Paraklesis. The Canon of Theophanes the Branded was used as the first canon of Matins on the feasts of major saints. In turn, Theophanes the Branded used previously existent verses from the Canon of St. John the Damascene which he wrote for the feast of the Raising of Lazarus to write his hymns. Specifically he borrowed the following Eirmos: 1, 3, 6, and 7 Odes. The rest he either composed himself or borrowed from other liturgical sources. In this way, the Small Paraklesis Canon took a similar form and shape as that of the Great Paraklesis Canon. 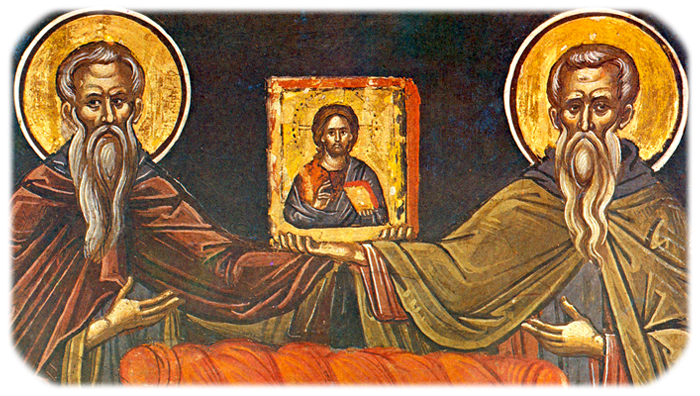 Theosteriktos the Confessor, abbot of Pelekete Monastery near Prusa, suffered for the Holy Icons under the impious emperor Constantine Copronymos (741-775). His feast day is February 29th in the Slavic Churches and March 17th in the Greek Churches. Theosteriktos was born in Triglia of Bithynia and became a monk at a young age at the Monastery of Saint John the Theologian, known also as Pelekete Monastery, where he later became abbot. During the persecution of Emperor Constantine V Copronymos, his general in Asia Minor, Michael Lachanodrakon, began a fierce persecution especially against the monastics who venerated the Holy Icons. On the night of Holy and Great Thursday in 763 the General came to Pelekete Monastery during the celebration of the Divine Liturgy. Abbot Theosteriktos was celebrating the Divine Liturgy together with 780 monks under him, 70 of which were hieromonks. Suddenly loud knocks at the Gate of the Monastery interrupted the solemn atmosphere, and 2,000 soldiers of the General were outside yelling, causing chills and tremors. The soldiers broke the Gate with axes and the mob entered the courtyard. General Michael Lachanodrakon rushed into the church with his army and approached the Abbot. Violently the General took the Holy Chalice and smashed it on the ground, and punched the Abbot in the face. This resulted in a fight between the monks and the soldiers. "Take this and sign immediately against the idols which you call icons, otherwise we will slaughter all of you. It is a decree of the pious King Constantine V."
"You should rather say Copronymos", said Abbot Theosteriktos. "We will never sign against the Sacred Icons, which we honorably venerate." Upon the holy Abbot saying this, the General angrily commanded the slaughter to begin. Within a few minutes, four hundred monks had fallen dead. Following this, the General gave another order: to tie the rest with chains and take them out to the courtyard. He then ordered a fire ignited at every corner of the Monastery for everything to be reduced to ashes. Thus the beautiful Monastery was reduced by the flames of fire. The captured monks were then led to Emperor Copronymos and appeared before him. Copronymos asked General Michael: "How many are there?" The General answered: "40 Hieromonks, 342 Monks and the Abbot." In a rage Copronymos addressed the monks: "Worthless Monks! Recalcitrant and reactionary in my kingdom, come before me! I am Constantine the Fifth and I do not banter." One monk with a smile on his face approached the Emperor, Sinesios by name, and he said: "Copronymos! We are children of Theosteriktos and learned from our Elder to trample upon the head of the devil and the Iconoclasts." By saying this, the Monk Sinesios sealed his fate. The Emperor ordered his immediate beheading. After this the Emperor questioned the monks one by one, and had each of those who abided by the Orthodox Faith to be beheaded at that moment. As the heart of Copronymos rejoiced, the blood of dozens of holy monks ran like a river. Following the slaughter, the Emperor ordered Theosteriktos to approach him. The Saint approached with joy for the opportunity to confess his Faith, yet with sadness and tears also for such a horror displayed. "Murderer! Executioner! You killed 780 of your children on a whim, in order to not throw away your idols which you call icons. Murderer, you will be known in the history books as committing infanticide." "Such dishonor is worthy of you, Copronymos. I am a venerator of the Venerable Icons and I thirst for this death. In fact, I'm in a rush to catch up with my golden and blessed children, my crown and praise." Seeing the slaughter ensue, many soldiers and officials decided to rise up against the Emperor at that moment, and the Emperor cringed in fear. He then called for his chief officer to save him. "Cursed Copronymos, Heretic, I am a venerator of the Venerable Icons. Slay me." The head of Aimilios fell, and the Emperor retired for the night. The next day the Emperor called forth again the Abbot, and receiving from him the same answers, it was ordered that his nose, ears and fingers be cut off. Then with pliers strips of skin were pulled from his body, and in a bloody state he was thrown into a dark prison where he was not to be given neither food or water, in order to die there. Yet Abbot Theosteriktos survived in this prison for nine years, thanks to the generosity of certain soldiers who sneaked in bread and water. In the year Copronymos died, Leo IV, his son, succeeded him to the throne. Though frail in body, he had a merciful soul. Leo freed all prisoners who venerated the Sacred Icons. Abbot Theosteriktos was released also and brought back to his Monastery, which now lay in ruin. Theosteriktos received offers from nearby monasteries to take him in, but he refused, preferring rather to live in his own Monastery, where he had lived with his children and lived happily. In the corner of the ruins he built himself a wooden hut and decided to live there for the rest of his life alone. It was there, among the ruins of his Monastery and after the experience of so much suffering, that he at some point composed the Small Paraklesis Canon to the Theotokos. After three years in seclusion, new monastics came to this holy Elder, who had no fingers, nose or ears, and asked him to be their abbot. Daring not to go against the will of God, Theosteriktos took them under his supervision, and within months 800 monks gathered in the Monastery. "Your precious Icon we venerate, O Good One, pleading forgiveness for our transgressions, Christ God..."